A wide variety of building materials make it possible to choose the most suitable home for the environment. To choose a comfortable house, the one essential factor you should consider is soundproofing. Residential soundproofing aims to decrease or eliminate the effects of exterior noise. The main focus of residential soundproofing in existing structures is the windows and doors. 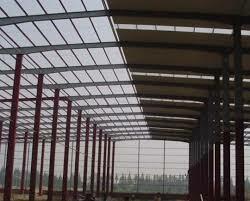 To choose a reliable and safety steel structure material is important. Solid wood doors are a better sound barrier than hollow doors. Sound insulation effect is a an important index in evaluating housing, light steel structure system installation window adopts hollow glass, sound insulation effect is good, sound insulation of 40 decibels; Composed of light steel keel gypsum board, heat preservation material wall, its sound insulation effect can be as high as 60 decibels. Sound proofing techniques include structural barrier between the roof and the attic and the application of insulation and plywood to eliminate excess noise. Residential soundproofing steel buildings may be durable, but this choice of construction materials also presents a challenge when looking for insulation to use on such buildings. It should be noted that aluminum and copper products are more prone to denting than harder metals such as steel. Choosing the right insulation for a metal building kit helps to reduce energy consumption.